I had wondered, before I showed up earnestly with my notepad and pen to cover the Charlotte Dujardin Masterclass at the Kentucky Horse Park in January, how exactly to approach the weekend. My assignment for the Chronicle was to recap Charlotte’s teachings to riders of various levels, but I wasn’t sure how relatable the information would be to a lower-level eventer—and a fairly recent convert at that. I had the feeling, as I looked around the arena, that the audience was hanging on every word from the Olympian. Thorough dressage believers, all. My relationship with dressage has been somewhat … strained. For me, dressage is like kale: I know I should love it. I watch everyone else happily filter Instagram photos of themselves enjoying it. I marvel at all it can do. But I just can’t enjoy my interactions with it, because it reminds me how bad I am at loving it. “It’s called dressage. It’s supposed to be like yoga for horse and rider,” I tell my chiropractor as he struggles to realign my stiff neck, jiggled out of place and ratcheted into place by tense muscles. If Dressage Queens would sniff at my position through the first 10 minutes of exercise, then their eyes would bulge in horror at my form after I become tired. While I assume I become less pathetic as the season goes on, I have no illusions that Charlotte wouldn’t kick me out of her ring before I’d made it down the centerline, whether it’s early spring or late summer. “But it creates such a partnership with the horse!” people sigh. Of course, I agree as I massage my biceps, burning as they are from having a 1,600-pound freight train lean directly on them before channeling her inner giraffe and bolting, counter-bent across the arena. When I am able to keep my wobbly arms steady and add consistent, determined leg, she bobbles straight up and down like a pogo stick as my poor trainer shouts, “You got about a half a stride of really beautiful canter there!” and I vaguely wonder why this always looks more comfortable when other people do it. Mostly, my feelings about dressage come from how utterly stupid it makes me feel. (Why can I never remember where all the letters are? Why aren’t they in alphabetical order? Why is K next to A?) It’s always felt like I’m striving for a completely impossible result—for either me or my horse. This occurred to me as I watched the training level pair, Erdstern and Ashley Madison, floating along at the trot before their lesson even began. 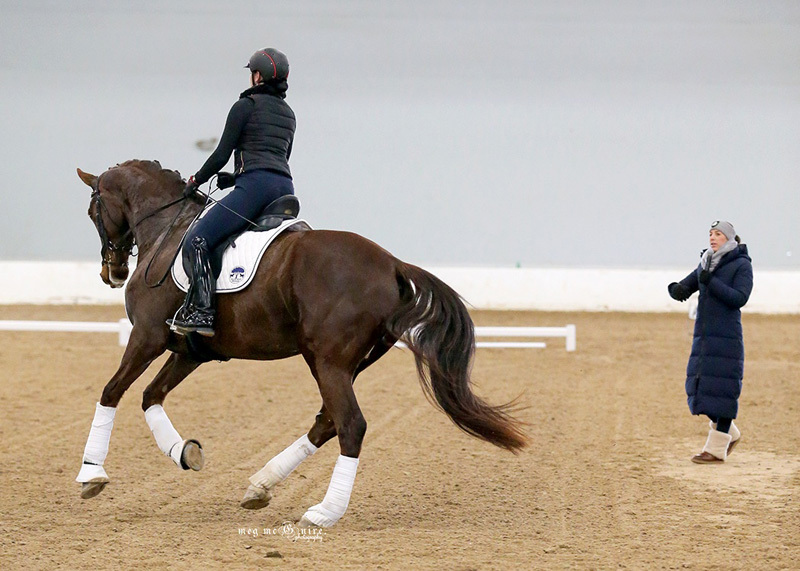 But farther along into the clinic, Dujardin emphasized two things that I believe dressage experts have tried to tell me without success before: 1) There are some basics that all horses and riders must spend hundreds, thousands of repetitions perfecting—no matter how experienced they are. Charlotte especially focused on transitions to illustrate this point. 2) Even in the best of circumstances, a horse’s progress is incremental. Development is a long game, lasting years, which means it only stands to reason many, many horses will not run up the levels by the end of their careers. These are completely obvious statements for most people in the sport, but I hadn’t stopped to think about them this way. The fact that I will never earn a bronze medal, don’t expect to compete beyond training level, and will very likely always struggle to make my 20-meter circles round does not mean that I am failing. You’ve gotten to know Jitterbug, the Chronicle’s Quadruped Correspondent, over her years of posting hilarious columns from a cantankerous draft-cross mare’s point of view. And now her “Human,” Natalie Voss, has joined our roster of bloggers to share her adventures as a hunter-rider-turned-eventer mounted on the ever-opinionated Jitterbug.